For the coming week, I'd like to focus on the how of photography instead of the what. This week's theme - pics taken with a smartphone - won't dictate a real subject. Rather, if you took it with a smartphone (or tablet, or basic feature phone, or any other mobile device), we want to see it. Why the heck am I doing this? Because I've realized that for all their limitations - lousy lenses, terribly small sensors, horrid dynamic range, slow response times, icky color rendition, etc. - smartphone cameras can be coaxed into taking fairly decent pictures on those rare occasions when the conditions are just right. More importantly, because they're often the only cameras we have on us when we're out and about, we either learn to live within their constraints or we come home with nothing. 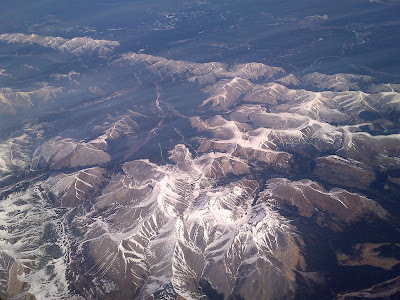 On a recent flight, I had been shooting out the window with my DSLR. But as I noticed the battery level dwindle to the danger zone, I pulled out my BlackBerry and put it to work. No worries: It was in airplane mode. Looking back at the results, I was pleasantly surprised that this photo-challenged smartphone - to be kind, it isn't the best mobile camera I've ever used - managed to avoid mucking up the scene with muddiness and blur. My theory? Shooting with a limited-function camera can't help but make us all better photographers. I hope we get to explore this one over the next week, and hope you'll all join in. Your turn: Pull out your mobile device (smartphone, tablet, basic cell phone, whatever you've got) and start shooting. Whatever you shoot is entirely up to you. Post it to your blog or website, then leave a comment here letting everyone know where to find it. Play as often as you like, and bring a friend along, too, as we encourage serially promiscuous photography. For more background on how Thematic Photographic - our weekly photo-sharing activity - works, please click here. I'm out of the challenge this week, sadly. I am the last person on earth that has a need to indulge in the mobile life. I prefer to keep my mobility private and unreachable. If I'm needed so urgently, which is anything ever really that urgent, there is a machine on my home phone. That's a great shot. I have hardly ever used my smartphone to take photos - maybe this will make me do so! Well, I, being smartphoneless -- or possibly just the owner of a dumbphone -- will have to sit this one out. I, too, have never bought one of them "sell phones" all you kids go on about. Just wanted to let you know that I will be sitting this week out. While hubby and I do have camera in our phones we almost never use them. I have taken two or three shots with mine to use for my wallpaper but do not know how to get them from the camera to the computer. I will see if my grandson can do that for me tomorrow. Amazing photo, beautiful. I might need to get a smartphone, if their pictures are that good these days. Mine aren't as good, but here they are. Wow, Carmi you really gave us a project that shoots outside our normal photography! I'm in for the fun here! After reading through the comments, I'm thinking we can post any photos from mobile devices....if it's mobile and it takes photos it's in!!! Right? Great photo - and I can see that a phone would be a good way of capturing it. However like some of the others I'm a dinosaur when it comes to mobile phones - with or without cameras. Nevertheless I've put up some shots taken with IPhones. Such a beautiful picture! I love this theme, because so many of my pictures are taken with my smart phone! I thought it was pure indulgence for my spouse to buy me an Iphone for Christmas, but now I just love it. I hardly ever use it as a phone, though. I use it for everything else. I DO use the camera function a lot. Rita, I email the photos to myself. That works, but it takes forever. There's probably a better way, I just have to figure it out. If your grandson has an idea, maybe you can tell me! Aunt Snow, there's an app for Flickr, which really hasn't worked all that great for me, and usually I just email my shots right to Flickr when I want to blog them. wow! THAT's with a smart phone?! beautiful!! sorry to say...i don't have a smart phone or ipad or iphone...just a plain old camera...ha! and a cell phone that takes the WORST pictures! I'm another without a smartphone, but its fun seeing what others have done! Facebook lockup ends. World shudders. Stairway to heaven? Not quite. On technology being evil. Or not. On getting started. Right now.